KIEV, Ukraine -- Russia is building up forces on its borders with Ukraine, prompting pro-Kiev forces and analysts to predict an impending pro-Russian attack in the near future. 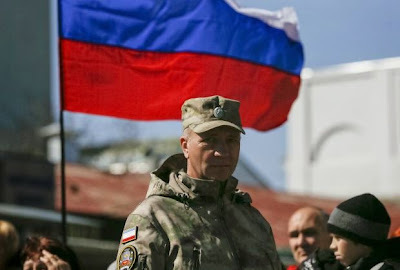 Alexander, a member of the People's Militia of Crimea, attends a rally marking the upcoming first anniversary of the Crimean referendum, to secede from Ukraine and join Russia, in Simferopol. Fighting in eastern Ukraine’s war-stricken Donbas region has fallen dramatically since an initially shaky ceasefire was signed by the leaders of Russia, Ukraine and the separatist groups in Minsk in February. However U.S. and Ukrainian officials have reported that Russia is gathering its regular troops at Russian-Ukrainian border again, fueling fears of another escalation of violence. “Putin is ramping up pressure on Ukraine by adding troops on the eastern border and in Crimea and by increasing the violations across the ceasefire line,” former U.S. ambassador to Ukraine John Herbst says. According to Herbst the situation is reminiscent to the pro-Russian offensive towards the Ukrainian town of Debaltseve which immediately preceded and even overlapped with the signing of the Minsk ceasefire in February. “Like most observers, I believe that there will be a new Kremlin-directed offensive; but I suspect it will be like the offensive in January,” Herbst believes there are strategic similarities between the Debaltseve offensive and the current security situation in Ukraine. “The Russians finally seized Debaltseve a few days after the 15th February ceasefire started, but that was the culmination of an offensive that began a couple of days after the Orthodox Christmas on 7th January,” Herbst says. Herbst notes that both ‘quiet periods’ featured significant movement of Russian arms into the Russian-controlled parts of the Donbas. Fighting in Debaltseve ceased on 19th February as Ukraine’s president Poroshenko announced that Ukrainian forces were retreating from the town. Sporadic outbreaks of violence have been reported since then, largely around the key port city of Mariupol near Shirokyne - a long term target for the pro-Russian separatists. Other cities, such as Odessa and Kharkiv, have also been targets of bombings. Neither Herbst nor the Ukrainian Ministry of Defence would speculate which city may be the next target for the advance, though Herbst believes an open attack on Mariupol may not be on the cards because of the size of the city and the diplomatic repercussions that such a large advance would have on Russia. “It will require a lot of Russian soldiers’ lives to take it and a level of fighting that will complicate Putin’s efforts to persuade the EU to ease sanctions,” he warns. Ukraine’s armed forces did not comment on whether a new Russian advance would take place but expressed assurance that defence preparations were being made in Mariupol and other parts of the country.